The Munchkin Man went shopping for a new wallet a few weeks ago. The Munchkin Man had a very difficult time finding the type of wallet and the brand name the Munchkin Man has always liked. The Munchkin Man went to a Nordstrom's. The Munchkin Man went to a Dilard's. The Munchkin Man went to a Macy's. The Munchkin Man went to a Kohl's. None of them carried the type of wallet and the brand name the Munchkin Man has always liked. The Munchkin Man has never liked these expensive wallets made with very fine and thinly crafted leather. The Munchkin Man bought one of these a number of years ago. The Munchkin Man's overactive sweat glands ruined it in less than a year. The Munchkin Man has never liked the "trifold" style of wallet. The Munchkin Man has never liked "velcro" wallets. The Munchkin Man has never liked wallets equipped with miniature coins purses which snap shut. The Munchkin Man has never liked long rectangular wallets which usually fit inside the jacket of a suit or sport coat. The Munchkin Man has always liked a simple old-fashioned solid black hip pocket style wallet which folds in half and has lots of pockets. The Munchkin Man likes to carry it in the Munchkin Man's left hand front pants pocket. The Munchkin Man also likes a wallet with a "divider" partition in the section where the bills go. The Munchkin Man finally found one at a Sear's for only $14. Its brand name was Buxton. This is the same brand name the Munchkin Man had been buying for years. But the Munchkin Man never had as much trouble finding and buying one before. The Buxton brand name has apparently become increasingly hard to find in the stores in the Munchkin Man's area. Maybe this type of wallet has gone out of style. But it is still the type of wallet the Munchkin Man likes. The only complaint the Munchkin Man has about the Munchkin Man's new Buxton wallet is that the Munchkin Man wishes that it had more pockets and hidden compartments. Otherwise, the Munchkin Man is satisfied. The Munchkin Man later discovered that the Munchkin Man could have bought a Buxton wallet in this style much more easily online from the Buxton web site. Do any of you like the same type of wallet the Munchkin Man likes? The Munchkin Man would be interested in hearing about the types and brand names of the wallets some of you prefer. Re: What Type Of Wallet Do You Prefer? Approximately every 8-10 years, I buy a new one for $10 at Walmart/Target/Kmart, and donate the old one to goodwill. I also have a few extra clear plastic "wallet windows" replacement inserts. I think I bought a few for $1 each at Target a while ago. normaldude wrote: Black, leather, tri-fold wallet. Thank you very much for sharing the details of the type of wallet you prefer. The Munchkin Man has never taken a liking to the "trifold" style. Maybe the Munchkin Man has never really given it a chance. The Munchkin Man forgot to mention one thing about the Munchkin Man's new Buxton wallet. It also came with a set of those clear plastic "wallet windows" inserts. However, the Munchkin Man has never had much use for these. The Munchkin Man finds that they take up more space than the Munchkin Man prefers. Therefore, the Munchkin Man removed them. Thanks again for sharing your wallet style preference. I actually have two separate "wallets." One holds only my cash and some business cards along with some other stuff. The other item holds by cards such as drivers license, car registration, credit/debit card, library card, health insurance card. This item has see-through windows for the top card in each half. I used one for my monthly train ticket back in my working days because all I needed to do was show it to the trainman. On two occasions in the 30+ years I have used this system, I had my cash wallet lost or stolen. But because the card pouch was intact, the setback was fairly small. All I lost was the cash (under $100 each time) while all the other more important things remained in my possession. The cash wallet I have has two folds so the paper bills get two "curls" in them, one near each end. Munchkin Man wrote: The Munchkin Man went shopping for a new wallet a few weeks ago. The Munchkin Man needs to learn about shopping online. I do not carry a wallet. I carry money and credit cards clipped together in my front pants pocket. I got mugged back when and the police told me how to do this and it works great. All kinds of back issues grow out of a big wallet in your back pocket. Plus when you travel putting any paperwork or wallets in your back pocket is just asking for trouble from thieves. It is nice because it keeps all of your credit cards, driver's license, etc from forming such a thick hump. Effectively reducing the thickness of the full wallet by half (depending on the amount if cash you carry). PS, Welcome back Munchkin Man! Brown. Leather. Folds in half. Those are my main criteria. My last few wallets have been on sale from Fossil. I go through one every 4-5 years or so. I've had the original nylon for years. I actually bought a replacement when it developed some holes in the corners, but the "rip-stop" nylon is true to its name and they haven't gotten any bigger so the replacement is still sitting on the shelf. It's amazing how efficiently it holds cards. I stack the credit cards face-to-face with one upside down so the embossed numbers don't overlap. The only difference in wallet preferences between Munchkin Man and FlyOverState is that FlyOverState likes to carry it in FlyOverState's right hand front pants pocket. My wallet preference is the same as yours. The one I have currently has the brand name Tex Tan on it and I'm sure I paid about $10 for it a number of years ago. I could find Tex Tax saddles online but not wallets. This ad from Amazon shows a similar Dockers wallet of the type although I would probably remover the extra insert for cards. I have also owned a couple of ray skin wallets and the skin will never wear out. Unfortunately, the stitching that holds it together does so don't believe it when they say it will last forever. I have also owned an eel skin wallet which was very nice. Easy... pick out a wallet from http://www.bigskinny.net. It sounds to me you would like http://www.bigskinny.net/multi-pocket.html. For years I had a thick, heavy leather wallet that was about as thick as two decks of cards. I made the switch to Big Skinny and now can barely tell I have a wallet in my pocket. Granted, it helped that I stopped carrying a few cards. However, my Big Skinny full is more slim than my empty leather wallet! If still want a leather wallet, you can get the best of both worlds: leather outside, and skinny inside. I've only had it a couple weeks but this thing is pretty awesome. It seems rigid. When in a pocket does it seem bulky? My dad got one from there and loves it as well. My mom kept buying him ones from various stores to try, but the one he picked out on the web is the one he actually uses. I've had an original front pocket wallet from Walletbe for years and I really like it. It contains my driver's license and various cards and I keep it in my left front pocket. I carry cash in my right front pocket. The wallet does include an elastic band intended to hold cash. I've just never used it for that purpose. I got the Flipside 2x. It's maybe 50% thicker than my phone and it's pretty light. I don't carry much around and this made me cut even a few more things out. I don't think it's bulky. I've always carried my wallet in my front pocket, so I don't sit on it and don't think you would want to. I barely know that it's there. With RFID cards and the "Enhanced License" for crossing the border, The RFID protection is one of the main reasons that I got it. I carry a Saddleback Leather Medium bifold wallet that is made like a tank. The only feature it does not have is the divider for folding money which I personally have never found to be useful and just adds bulk. It will hold up to 6 cards, more if they are thin. Two concealed pockets, one on each side. The card slots are tight, but loosen a bit after use. I also have a Saddleback front pocket ID wallet that I often use. You can take a look on their website. Worth looking at the website if only for the owners story! I use a Coach-brand leather business card holder to carry my credit cards, ID, etc., and use a money clip----in another pocket----to carry my cash. +1 Same wallet here with the business card holder add-on. Had it since it came out and there is no wear at all on it still. I use it every day in my front pocket with my keys - phone in other front pocket. I got a Slim Clip as a gift a few years ago and I really like it. It holds cards on one side and cash on the other. I tried the paperclip for a while, but I always seemed to be fiddling with separating cash from credit cards. Recently I went to a 2 wallet system (patent pending ). For European travel I go to a more refined security arrangement. But that is not the main topic here I think. Haven't carried a wallet in 50 years (since loosing one). Paper cash goes in right rear pocket, coins in right pocket, drivers license and credit/debit card in left pocket. Hawkeye5 wrote: I carry a Saddleback Leather Medium bifold wallet that is made like a tank. My wallet rarely lives anywhere but in a jacket pocket. Generally speaking, the slimmer the better. And yet for some reason I have always hated bifolds. I think it's got to be their tendency to split themselves open -- when closed, a trifold will tend to stay closed better. I also prefer the mechanics of opening a trifold, and the manner in which bills are placed and folded into them. And the top slot / middle section of the trifold is ideal for quick and easy Metrocard access for swiping in at the turnstiles. That said, I do my best to keep the number of items in my wallet to an absolute minimum. Given the number of slots / cards it was designed to accommodate, it is less than half full at all times. The wallet I currently use is a Brookstone black leather trifold with a mesh ID window. With 5-6 bills and the usual card load in there, it is less than 1.5 cm thick. Somewhat tangential to this. I notice I don't carry much cash anymore. Often none at all. I have a bank card and a low-limit credit card. I use the bank card for gas, groceries, etc., and the credit card if I really need to purchase something more substantial. I find I don't need cash all that often. I might get some if we're going out to eat because I prefer to leave tips in cash. Do you carry much cash? Tumi bi-fold on Ebay brand new $50. Super durable leather. Not a single shred or tear anywhere after 5 years. Looks like it's just a few months used. flamtap wrote: Somewhat tangential to this. I notice I don't carry much cash anymore. Often none at all. I have a bank card and a low-limit credit card. I use the bank card for gas, groceries, etc., and the credit card if I really need to purchase something more substantial. I find I don't need cash all that often. I might get some if we're going out to eat because I prefer to leave tips in cash. Why use a bank card for all those purchases instead of a rewards credit card? I don't like to carry a wallet in my pocket, but if I am going somewhere, I carry one in my right hip pocket. I have a leather bifold that I have had for years. I think I have a couple of backups at home. The only thing I carry in my wallet is cards. I carry cash in my right front pocket with a rubber band wrapped around it. I carry quite a bit of cash because I don't like to use credit cards. I've got an older version of the Norton and really like it. Will never carry a wallet in my back pocket again after having leg pain and sciatic nerve flare ups. I prefer one filled with cash. Whichever one my wife buys me for the Christmas after my wallet get close to worn into trash. Last one was rather more expensive than I would have purchased but has held up extremely well, better than any other wallet I have ever owned. I've grown fond of it. My current wallet is a Relic Pilot money clip. BTW, I didn't actually know the model name until I looked it up. It was $10 from Kohls, but looks like it's not available for sale anymore. 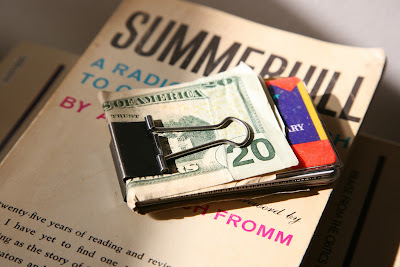 I am thinking about changing back to a traditional wallet since the magnetic money clip portion is pretty worn at this point. And so I can stop flashing my cash, even though I always put the $1 bills on the outside. I like the compact nature of this wallet so I can put it in the rear right pocket (normal use) or front right pocket (usually when traveling) without issue. This little wallet is great. Put your license in the center pocket, one or two bank/credit cards in the two outside card pockets, and cash tucked safely with the clip. Four items and you are good to go 99% of the time. I've had this Tumi clip/wallet combo for a couple years now, and the money clip is as tight and as strong as the day I got it, even after having a large number of bills in the clip. Tumi products are fantastic. More expensive, but they can last a lifetime. I stopped carrying a wallet a few years ago. I just carry a small amount of cash wrapped around a credit card. btenny wrote: I do not carry a wallet. I carry money and credit cards clipped together in my front pants pocket. I got mugged back when and the police told me how to do this and it works great. All kinds of back issues grow out of a big wallet in your back pocket. Plus when you travel putting any paperwork or wallets in your back pocket is just asking for trouble from thieves. The Munchkin Man would like to thank you for your excellent suggestion. The Munchkin Man still believes that the Munchkin Man would still prefer to carry the Munchkin Man's money and credit cards in a wallet instead of having them clipped together. The Munchkin Man no longer carries the Munchkin Man's wallet in the Munchkin Man's back pocket. The Munchkin Man once had a terrible experience as a result of doing exactly that. The Munchkin Man was making a one day round trip from Norfolk, Virginia, to Washington D.C., to Baltimore, Maryland, and then back again. The Munchkin Man used a plane flight to get to Washington D.C. and a Greyhound bus to get to Baltimore, Maryland. On the return trip, the Munchkin Man had just caught a Greyhound bus from Baltimore, Maryland, to the Greyhound bus station in Washington D.C. While the Munchkin Man was in the Greyhound bus station in Washington D.C., the Munchkin Man suddenly noticed that the Munchkin Man's wallet was missing from the Munchkin Man's back pocket. This put the Munchkin Man in a state of panic. The only money the Munchkin Man had was some spare change in the Munchkin Man's front pants pockets. By a stroke of luck, the Munchkin Man also had the Munchkin Man's plane ticket for the Munchkin Man's return flight back to Norfolk, Virginia, in the Munchkin Man's front pants pocket. But the Munchkin Man had no money to pay for a taxi ride to the airport. The Munchkin Man had a plane to catch. In a state of desperation, the Munchkin Man talked to a taxi drver and explained that the Munchkin Man's wallet had just been picked and that the Munchkin Man had no money to pay the taxi driver for a ride to the airport. The Munchkin Man asked the taxi driver if the taxi driver would accept a check from the Munchkin Man, one that the Munchkin Man would be willing to mail to the taxi driver, once the Munchkin Man got home. The Munchkin Man showed the taxi driver the Munchkin Man's plane ticket to try to convince the taxi driver that the Munchkin Man was sincere. At first, the taxi driver said no. Finally, the taxi driver very reluctantly agreed to do so. The taxi driver was cussing all the way to the airport. The taxi driver seemed to be convinced that the Munchkin Man was going to rip off the taxi driver. When the taxi driver arrived at the airport, the taxi driver gave the Munchkin Man the taxi driver's name and address for sending the check. The Munchkin Man thanked the taxi driver. At the airport, the Munchkin Man had to explain that the Munchkin Man's wallet had been picked and that the Munchkin Man had no identification to go along with the Munchkin Man's plane ticket. They let the Munchkin Man on board anyway. Once the Munchkin Man's plane landed in Norfolk, Virginia, the Munchkin Man had yet another obstacle to overcome. The Munchkin Man had to explain to the parking lot attendant that the Munchkin Man's wallet had been picked and that the Munchkin Man had no money to pay for the Munchkin Man's parking fee. Fortunately, the parking lot attendant was nice about it and told the Munchkin Man to come back and pay the parking lot attendant the next day. The Munchkin Man's nerves were shot when the Munchkin Man finally got home. The next day the Munchkin Man wrote a thank you letter and a check to the taxi driver in Washington D.C. The Munchkin Man also drove back out to the airport to pay the parking lot attendant. Then the Munchkin Man had to go about the long and painful process of getting a new driver's license. Fortunately, the Munchkin Man was not carrying any credit cards in the Munchkin Man's wallet when the Munchkin Man's wallet got picked. And that is why the Munchkin Man no longer carries the Munchkin Man's wallet in the Munchkin Man's back pocket. The Munchkin Man would like to thank you all for sharing your wallet preferences with the Munchkin Man and for suggesting a few alternate wallet brands that the Munchkin Man might like. The Munchkin Man likes some of these wallets very much. The Munchkin Man will be sure to look into them. The Munchkin Man believes that the Munchkin Man can get a better wallet, one that is in the Munchkin Man's favorite style, than the Buxton brand wallet the Munchkin Man recently bought. The Munchkin Man has to drive out to a private tutoring session in a few minutes. The Munchkin Man will try to reply to some of your ideas and suggestions later on this evening when the Munchkin Man gets home. This may be my next wallet.. It's expensive but I keep wallets about 10years. Also I tend to carry a lot of cash and drive all day so the low profile is appealing for seat comfort. Last edited by VTXVX on Sun Jun 22, 2014 7:36 pm, edited 2 times in total. I prefer a slim wallet that I can carry just a few cards in. I don't need a file cabinet. It also has to be compact enough to carry in my front pocket. For over thirty years our family was in the leather business and we sold all types of leather accessories in all price ranges, to all ages, in all parts of the country. I'm able to be a boglehead in part thanks to the many wallets we sold. I know of what I speak. In the spirit of a humorous aside to this thread I'll quote my wife who used to enjoy waiting on the wallet customers at our stores. She always said that men looking for a new wallet were ----the pickiest people on earth--it has to be just right--it MUST have a pocket just like the one they bought 15 years ago. The color of the leather is too dark, too light, too reddish, too shiny,too dull-looking. It doesn't have a keyholder OR it has a keyholder and they don't want one. It has too many slots, not enough slots, the leather is too soft or too stiff, it's too small and it'll fall out of my pocket, or it's too big and I won't be able to get it out of my pocket. Or it doesn't have enough or has too many plastic sleeves for their pictures, etc. You get the idea. Many guys showed us their George Costanza wallets and said they had to have something smaller and she'd reply they needed to clean out the wallet and carry less. They wouldn't be able to do that because they needed everything but they really wanted a smaller wallet. The most common response we heard when a guy learned the price was "If I spend that much I won't have anything left to put in it." Men looking to replace a wallet may not be the pickiest people. My vote for that is a woman trying to replace her wallet. Last edited by VTXVX on Sun Jun 22, 2014 7:18 pm, edited 1 time in total. I just ordered a TGT. Haven't tried it yet, though. Separately, has anyone ever told the Munchkin Man that he writes like a Chuck Pahalniuk novel?